Last night the Orioles won their fifth straight game and had almost 43,000 fans in the stands. 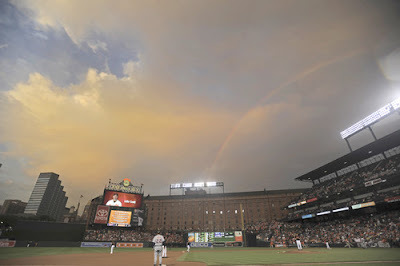 A rainbow even was seen above the stadium. Maybe it is a sign from the baseball gods. Prior to last night they were lucky to get 13,000 to a game. Due to a series of injuries, and a near fan insurrection, the management of the O's has brought up four young rookies in the past week who have all out performed their veteran counterparts. They are pitching like crazy, hitting home runs, and playing good defense. Suddenly, the old-timers on the team, used to losing, are feeling the youthful energy course thru their veins and the team is beating the pants off those they are playing. They just took two games from the Detroit Tigers who are in first place in the Central Division. Mary Beth told me she actually saw me smile last night while watching the game. During our 11-year relationship, the same amount of time that the O's have had losing seasons, I've never once smiled during a game.......OK that is a bit of an exaggeration but you get the drift. Let's hope it continues. I'll keep you posted. André Shepherd has refused orders from the US Army to go to Iraq. Shepherd, 32, grew up in Ohio, where he attended college. In 2003, when unemployed, he joined the U.S. Army. He was trained as an Apache helicopter mechanic and was stationed in Germany at the U.S. Army's Ansbach-Katterbach base. From there he was deployed in 2004 to Iraq for six months. In 2007, back in Germany, he received orders to return to Iraq. 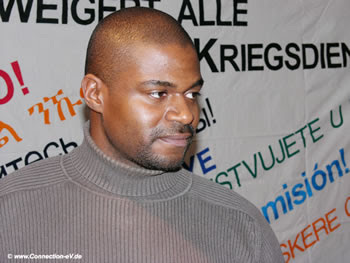 In April 2007, he went absent without leave (AWOL) and lived underground in Germany. He formally applied for asylum in Germany on November 26, 2008. His application references a directive of the European Union under which soldiers must be granted asylum in the E.U. if they have reason to fear persecution in their home countries for refusing to participate in crimes or actions that violate international law. Shepherd is currently living in an asylum facility in western Germany together with other asylum applicants, primarily from Iraq and Afghanistan; the facility and a small living stipend are provided by the German government pending the outcome of his case. This interview was previously published in the national German daily newspaper junge Welt on May 23, 2009, the 60th anniversary of the German Constitution. Since the "war on terror" began, there have been many U.S. soldiers who have spoken out and many who have refused to serve. But you are the first so far to apply for asylum in Germany. What are the grounds on which your application is based? Well, it's very simple: In the war of aggression against the Iraqi people, the United States violated not only domestic law, but international law as well. The U.S. government has deceived not only the American public, but also the international community, the Iraqi community, as well as the military community. And the atrocities that have been committed there these past six years are great breaches of the Geneva Conventions. My applying for asylum is based on the grounds that international law has been broken and that I do not want to be forced to fight in an illegal war. In your asylum application, you mention the Principles of the International Military Tribunal at Nuremberg, which were incorporated in the UN Charter. In Nuremberg, the chief U.S. prosecutor, Robert H. Jackson, stated: "To initiate a war of aggression, therefore, is not only an international crime; it is the supreme international crime differing only from other war crimes in that it contains within itself the accumulated evil of the whole." In opening the trial on behalf of the United States, he stated that "while this law is first applied against German aggressors, this law includes and if it is to serve a useful purpose it must condemn aggression by any other nations, including those which sit here now in judgment." What does Nuremberg mean to you? The Nuremberg statutes are the foundation of many U.S. soldiers' refusal of the Iraq war, and to some extent of the Afghanistan war. The United States with its Allies after World War II crafted these laws stating that even though you've gotten orders to commit crimes against humanity, you don't have to follow them, because every person has their own conscience. That was more than 60 years ago. Today the U.S. government seems to be under the impression that those rules do not apply to it. In invading Iraq, they did not wait for a UN mandate, they didn't let the inspectors do their job, and they made up stories about who's a real threat. This totally violated everything stated in the Nuremberg statutes. The U.S. Constitution states that the U.S. is bound to our international treaties, for example with the UN. When we ignore the UN, we are violating the U.S. Constitution, which every U.S. soldier is sworn to uphold. And the U.S. must also respect our own very strict laws against war crimes and torture. Since the Obama administration refuses to investigate and prosecute the previous administration, it's clear to me that the Obama administration is an accomplice to the previous administration's crimes. They're setting a very dangerous precedent for the future of the world, something I don't want to see. The German people are well aware of the history; it is here that the Nuremberg tenets were first set down. Now we have to find a way to restore those tenets, to actually respect the Nuremberg tenets as well as the Geneva Conventions. Germany needs to tell the U.S., "Look, you guys helped create these laws, and now you guys should abide by your own rules. " When you were stationed in Ansbach-Katterbach, were you aware of the German citizens' campaign to prevent the U.S. from enlarging the base there? Yes, there were protests outside of the Katterbach base. Being inside, we understood that the German people weren't against us as soldiers. They were just protesting against Germany's further involvement in U.S. imperialism. So the relationship between us Americans and the Germans working on the base was actually still good. We were of course not allowed to join the protests. I am sure the U.S. military assumed that 50% of the GIs would have been out there protesting. A lot of the soldiers understand what is going on - to the point that we realize that we are just a mercenary army for a few rich people. But a significant number of GIs, about 60%, have families, so it's very difficult for them to go AWOL or make massive resistance. As part of their protest, the citizens of Ansbach and Katterbach circulated a petition citing Article 26 of the German Constitution, pronounced 60 years ago on May 23rd, 1949, in the Basic Law of the Federal Republic of Germany. Article 26 states that the preparation of aggressive war from German soil is unconstitutional and a criminal offense. In Kaiserslautern and in Ramstein, where there are also U.S. bases, there were also petitions circulated citing this Article. These German believe that the U.S. is violating the German Constitution by preparing aggressive war from German soil. Were the GIs aware of this provision of the German Constitution? We received almost no information about the German Constitution at all. This seems strange to me, because if we're supposedly in Germany to defend German democracy, shouldn't we know something about it? The fact is that wherever U.S. soldiers are sent, they are taught almost nothing about the people, the culture, the beliefs and laws in the countries we are occupying. When I was in Iraq, they didn't teach us any Arabic. In Ansbach, they do offer an optional German course, but we work long hours speaking English all day, so most GIs don't learn much German. Now that I have been living among Germans for the past eighteen months, I have learned that very many of them are very much against using war to solve international problems or to aggress against people. This comes from what they've learned from their own history. Article 26 of the German Constitution was written in the spirit of the Nuremberg statutes, which state that launching an aggressive war is the most serious crime. The U.S. and the Western Allies approved and authorized the German Constitution. How can the U.S. say we are here in Germany to defend democracy when we are ignoring and violating not only the Nuremberg statutes and the Geneva Conventions and the U.S. Constitution, but also the German Constitution? What is your understanding of why Germany is allowing the U.S. to conduct these wars from German soil? Honestly, I cannot answer that: you could look at it from the political side; you could look at it from the economic side. Or maybe Germany just has a hands-off approach: "You guys are paying the gas, you guys are paying us for the rental space, so you guys just do your thing, and we're not going to do anything about it." So in filing this application for asylum, it's not just about finding a place to live or something like that: you're trying to raise a larger historical and political principle? Yes, that's correct, because it is my sincere belief that the United States has gone too far. In Iraq alone 1.3 million people have died so far, and that includes American soldiers as well. We've attacked several countries over the past eight or nine years: Afghanistan, Syria, Pakistan, Iraq, and some places in the Sudan. All over the world, we're just destroying property and killing people, all based on lies. And I feel like that I have to do everything I can to help put an end to this. I feel guilty enough for having taken a part in this war for almost five years. I want to be able to atone for that. Why didn't you go through the U.S. legal system and apply to the Army for conscientious objector status? When I asked my NCO (officer) about applying as a CO (conscientious objector), he told me that you have to be against fighting in all wars of every form. And that doesn't work for me, because of course if you're being overrun by a foreign invader, you would have to fight back. According to U.S. Army regulations, this means you are not a conscientious objector. I also learned of the case of Agustín Aguayo and saw how the military treated him. He was based Schweinfurt, Germany, not far from where I was in Ansbach. He tried to go through the military procedures to be recognized as a conscientious objector, and he refused to load his weapon. Twice he turned himself in to the U.S. authorities and said, "Look, I'm a CO, and I can't do this." But the military wanted to force him to go back and fight anyway. Ultimately they put him in jail in Mannheim. This showed me that I could not expect any help from within the military, and I decided to fight for my rights from the outside. Can you think of any moment when you suddenly realized, "What I'm doing here is wrong?" I can't pick only one moment, because this was a process that went on for years. Falludja was one. Looking at the aftermath of that battle, especially what the Marines, and the Air Force, and the Apache helicopters did to that city -- the devastation caused by these machines and the air war, also in Basra and in many other Iraqi cities -- I realized that if it weren't for my work and the work of the other mechanics, those Apaches wouldn't have gotten very far. We were constantly working, 12 hours a day, 6 days a week, to make sure this sophisticated equipment continued to fly, especially in the hard conditions in Iraq with all the sand storms and the temperature changes from 140 degrees in the day to 60 at night. Had we, the mechanics of these aircraft, not done our jobs and refused from the beginning to take part in this war, a lot of those people would still be alive, and a lot of the infrastructure in Iraq would still be functioning. And then there was when one of the Iraqi guys working for the U.S. Army on our sandbags told me how he didn't understand why we were destroying their city, destroying their infrastructure, arresting people. And I'm just standing there like "what?!" I can't believe this stuff is happening, because I thought the military is supposed to be fighting for the rights of people. They're not supposed to torture. They're the ones who are supposed to get rid of the torturers and to stop the rapists and to help people to have a better life. And when I heard what we're really doing - it just turns your whole world upside down! And then there are the 937 lies of George W. Bush to the American people: you just feel like a fool, because we signed up to do X, but we wound up doing Y and Z and who knows what else. We killed people; some of our people got killed. An entire country, two countries, are completely destroyed. I keep wondering: what was this all for? Ask anybody, why are we in Iraq? And you hear several theories: Israel, oil, strategic purposes for Iran, whatever, but no one really has the answer. Same thing in Afghanistan: the NATO mission only went to Afghanistan because of U.S. insistence. We have to force the U.S. to clarify what the actual objective in Afghanistan is. Are they there to help out the drug dealers cultivating heroin, or for the Unical pipeline, or are they there just to have a forward base to go into China or Russia? Why are we there? Do you think President Obama is going to change any of this? No. Obama has the backing of the international corporations. And the people who gave him the most money are the ones whose interests are going to be served first. And it's quite obvious. He won't go after the prior administration for the war crimes; he won't pull out of Iraq. He's leaving 50,000 soldiers to conduct combat missions in Iraq. That means the war is continuing. He wants to escalate the war in Afghanistan. He wants to keep pushing for AFRICOM, the U.S. command for Africa based in Stuttgart, and he's pushing for the missile shield to try to encircle Russia and Iran. These things show me that Barack Obama is not going to change anything. And Obama is only one guy. He still has to deal with the entire Congress, the court system, the Pentagon. The military has been around for over 220 some years, and they're not going to change overnight just because there's a new Commander-in-Chief. They're still arresting people who refuse to fight. They're still putting them in jail, giving them dishonorable discharges, and some are facing possible felony convictions. But Obama has yet to speak of the growing number of soldiers refusing to fight for him - well, first Bush, and now him. So I don't see President Obama granting anyone clemency until the entire "war on terror" is finished, and Afghanistan and Iraq are part of the same war. How is your asylum application progressing? We had a hearing on the 4th of February with my attorney, Dr. Reinhard Marx, and myself at the Federal Office of Migration and Immigration. Dr. Marx was recommended to me by Amnesty International. I believe that we presented our case very well, and we're waiting to see what the decision is. If the Office of Migration and Immigration were to deny my request for asylum, then I would bring my case to court in Germany. Because of the political sensitivity of this case, and because this is a precedent-setting case, it could take a lot of time. Many U.S. soldiers who have fled the military are living underground in the U.S. and dozens more are likely in Europe. In Canada, many of them have applied for asylum, but since last summer they are being deported and then imprisoned in the U.S. What if Germany rejects your asylum application? Then I'm facing a U.S. military court martial and jail time. I'm not saying I would go back to the U.S. willingly; I would still try to find another way to build a life somewhere. What if you are granted asylum in Germany? The day I am legally allowed to go to the German Employment Office, I will probably camp outside so I can be the first one in there, because being 32 years old and healthy, I feel I should be able to make my own way. I'm taking classes to learn German, and I'm trying to get into the University of Karlsruhe so that I can study computer science. I want to get the Bachelor's or even the Master's so that I can eventually start my own business. My ultimate dream job would be to work with German and Japanese companies, which are the foremost leaders in information technology, to develop artificial intelligence. If Germany granted you asylum, would large numbers of GIs who are stationed here start walking off the bases? I would see maybe like 100 or 200, but I don't see 30,000 soldiers applying for asylum in Germany. It's no easy thing, because you're basically saying goodbye to your country, perhaps for the rest of your life. That's a really big step. You have to say goodbye to your family. You've got to learn a new language and try to fit into the culture. You've got to deal with homesickness. It is a very important personal step that a lot of soldiers would find difficult. But you are taking all these difficulties upon yourself. Why do you feel called to do this? Because I was sick of watching the United States degenerate into something I can't even recognize anymore. The America that I grew up in isn't there anymore. Between Clinton, Bush, and now Obama, the U.S. is sliding from the constitutional republic that it was to where now the corporations are just taking all the fruits of the American people's labor; the country's really poor, we've got endless war everywhere. 60 years from now people will be saying that we were the country that destroyed half the Middle East for nothing. They're building up a civilian corps that'll spy and turn in everybody, you know, like a modern day Stasi. These things are very disturbing. This is a country that I don't want to live in or raise my future children in. America's going down the exact same path as the Roman Empire, and it's really sad, having grown up there, to watch the destruction slowly happen before your eyes. Sometimes you feel, no matter what you do, it's going to happen anyway. There have been many people before who have been sounding the alarm bells, many peace organizations. And I want to help, put my hand in and try to stop it as well. And this is something that's been building up over time, because I'm totally hurt. I feel cheated. I feel lied to. You know, I helped murder people in Iraq for nothing. These are things I'm not proud of whatsoever, and I want to be able to turn this around and bring the people ultimately responsible for this to justice. Because had I known back then what I know now, I never would have signed up in the first place. Help raise awareness internationally, because this is not just about me. It's about the other soldiers as well. We're all in this together. And especially it's about the Iraqi people, the Afghan people, the dead soldiers, just everyone. Organizations people can contact are Military Counseling Network (MCN) or Connection e.V., Tübingen Progressive Americans, Munich American Peace Committee, Iraq Veterans Against the War, and it's good to contact with DFG-VK in Germany - they're a national organization. Right now we're collecting letters to give to the German government to show the support of the German people. The German government also needs to know that Americans and people from other countries support my request for asylum. This is an international problem, and I believe in an international solution. May 30 will be a national day of actions calling for a single-payer health care program. We have the next 60-days to push hard to break the insurance corporations lock on our health care system. In this video Sen. Max Baucus (D-Montana) says that single-payer is not on the table because it can't pass. And why can't it pass? It can't pass because the for-profit insurance corporations have the US Congress in the bag. You see the snide, self-assured, arrogant Max Baucus sit in control of the Senate committee that is putting together the plan and he is the "hired gun" of the corporations. Baucus is also the front-man for Obama. He is carrying the water for Obama on health care. The corporate plan the Congress will eventually pass will not work. It will mandate that you have to buy health care insurance just like you have to buy auto insurance. If you can't afford it then the federal government will subsidize your policy. In other words the federal taxpayer will feed these greedy corporations. And I predict that the health insurance policy that the person gets with government subsidy will be an inferior product that will have large gaps in coverage. So in the end the insurance companies keep getting rich, we will still have a two-tiered system (one for the rich and one for everyone else), and health care costs will keep going sky high. The only solution is single-payer - everyone in and no one left out. We must take the profits out of health care now. I will be attending the rally in Augusta on Saturday, May 30 at the state capitol. It begins at noon. Now is the time for everyone to speak out. Please find a way to help this movement out. I've been asked by quite a number of people in the last couple days about my reaction to North Korea's underground nuclear test. My response has been low-key, more like a shrug than anything else. What I am thinking is basically, what do you expect under the circumstances? For my Global Network friends in South Korea and Japan it is quite different. They are feeling much more emotion about the situation. They are living right smack-dab in the middle of a region where the US is working overtime to create a new arms race - that will ultimately be pointed at China and Russia. North Korea is just the ploy to establish fear - but not the real "prize". Sung-Hee Choi from South Korea wrote, "It has been a long time that the western propaganda has manipulated the people to abhor the North Korea and its leaders. They did everything to push the North Korea to the edge. I am not saying the North Korea leaders are immaculate. ..... Regarding Western propaganda, it was so persistent that even many peace activists in the world have been affected by it. It was one of the most difficult things that I had to encounter in the America. [Where she lived for 10 years.] It is not only me. The difficulty to make understand the North Korea's activities to the people outside of Korea has been the most difficult task for many Korean peace activists." Then from Makio Sato in Japan we heard, "The US has ignited some right-wingers in Japan's Diet [Parliament] in order to rearm Japan and dispatch Japanese soldiers along with their own, and seduced some grudge-bearing economic leaders to drop off the self-restraint of not producing weapons, in order to jointly produce weapons and robot soldiers and planes..... Japan is edging towards rearming. If Japan rearms itself, what percentage of hope will be left in Korean reunification? We have to stop this." The US goal is to return Japan to its aggressive fascist warlike state which would this time around become a US partner in controlling China. Japan would become the Asian-Pacific regional equivalent of Israel which serves as the US guard-dog in the Middle East. The US is now preparing India for that job on China's other front. Georgia is also being set-up for that role with Russia, as NATO has already been. It's not at all difficult to see the US "grand strategy" taking shape if you just fit the pieces of the puzzle together. Obama is on-board with the program. Just days ago V-P Joe Biden sent word to Georgia that we were with them all the way and will be bringing them into NATO real soon. Then once they are in NATO, and the US can use them to stimulate more fighting with Russia, the NATO treaty will "require" that the US rush to "protect" Georgia from an "aggressive" Russia. Obama's job is to make it all look like the US is the force for good, always reaching out the friendly hand, trying to be Mr. Nice Guy, while in fact we've been setting up the whole deadly scheme. It is classic empire building and sad to say the US has the disease big-time. 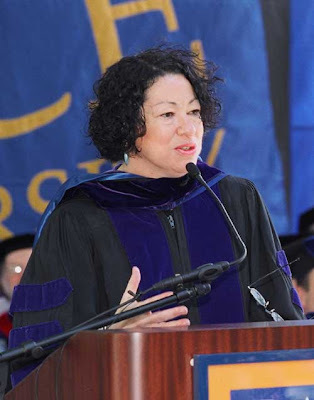 President Obama will nominate Judge Sonia Sotomayor for Supreme Court. She is widely considered to be a centrist. What that means in actual rulings remains to be seen. An analysis of her appeals court rulings can be found here. Early indications are that she won't be much of a change from retiring Judge Souter, but will be a bit to his left. She grew up in a housing project in the South Bronx in New York. Her father, a tool-and-die worker with a third-grade education, died when she was nine. Her mother, a nurse, raised Sotomayor and her younger brother, who is now a doctor, on a modest salary. She went to Yale Law School and was nominated by President George H. W. Bush to a seat on the U.S. District Court for the Southern District of New York. See Black Agenda Report's story on her here. According to an organization I am associated with, called National Alliance of Public Transportation Advocates, "the American Clean Energy Security Act (ACESA) is moving through the House in Washington this week. Though ACESA would establish emission reduction goals for the transportation sector, no funding is made available from the proposed cap-and-trade system to finance public mass transportation investments to reduce emissions. "ACESA in its present form fails to invest in the transportation sector in an effective and sustainable manner that recognizes the role of public transportation and other strategies that provide Americans with more choices in our transportation system." In addition, as the video well documents, the bill is a sellout to the banks, big coal and other energy giants. Once again we see Obama and the Democrats cave to their corporate masters and take the path of least resistance. They talk big about climate change but do little to deliver real substance. When does the mainstream environmental community get out of bed with the politicians and really fight for the Mother Earth and the future generations? The last two days I've spent many hours in the back yard stacking wood. It's a wonderful meditation and it's one of the few times in my life where I can actually begin something and soon see the results - not like in the political world where "change" is fleeting. 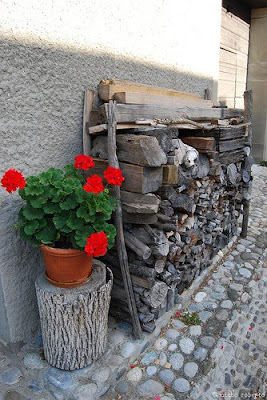 I spent quite a while on-line looking at pictures of different wood piles around the world but this photo I liked the best. It's a small wood pile, compared to the two cords worth I am stacking, but still a lovely shot. We put our tomato plants in today so our garden is now pretty much totally in the ground. Housemates Maureen and Karen have done most of the planting. I've been doing the wood pile and Mary Beth has been working on the inside of the house. It's a real team effort and tonight we sat out in our garden for dinner enjoying the cool temperatures and all feeling pride about how much we have accomplished. Karen gave thanks for how well we all fit together at the Addams-Mellman House (AMH). For those not up to snuff on the AMH it is named after Jane Addams who was regarded as one of the founders of the field of social work and was a strong opponent of World War I. She took a lot of heat for being against that war but won the Nobel Peace Prize in 1931. The AMH is also named after economist Seymour Mellman who taught at Columbia University and is regarded as the father of the call for economic conversion of the military industrial complex. Mellman is also credited with originating the term "permanent war economy" and while alive gave energy and voice to the movement to reorient America toward an understanding that escalating military production creates fewer jobs and a weaker economy than alternative peaceful production. So considering we have two social workers at the AMH, and that we are all peace activists, the Addams-Mellman name was perfect for us. We are doing our best to bring the works and ideas of Jane Addams and Seymour Mellman into our home and into our community. Stop by for a visit if you are ever in Bath, Maine. Former Minnesota Governor Jesse Ventura (an Independent) debates torture on the popular TV show "The View". Not long ago I saw Ventura on C-SPAN promoting his new book. He told a remarkable story about getting a call from the CIA soon after getting elected as governor. They told them they wanted to talk with him. He said, "Sure where are you?" They told him, "In the basement." So Ventura went down into the basement of the state capitol and the CIA asked him, "What do you plan to do as governor?" Ventura said that politics is like his old business, professional wrestling. After a no-holds-barred match the opposing wrestling "enemies" would go out drinking together. He said he thought there was no real difference between the Democrats and Republicans these days. I think Ventura is right about that one.